Low-wage workers are more diverse than you think How do we know whether development pays for itself? Recently, the Bureau of Labor Statistics published a map of industry sectors with the highest employment by state over the past couple of decades. 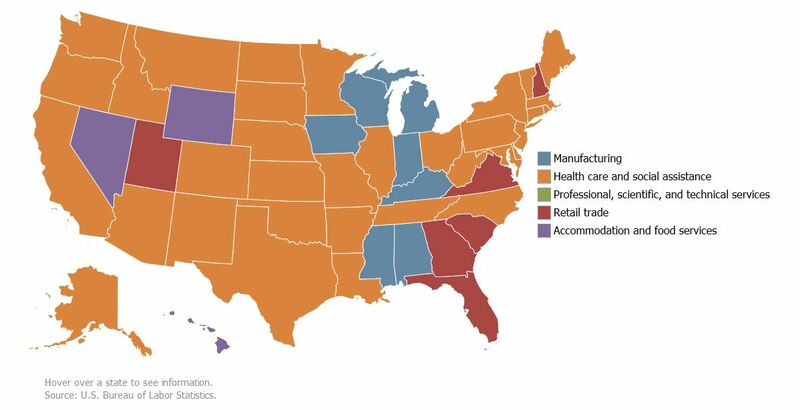 The map shows clearly America’s shift from manufacturing to retail to healthcare. 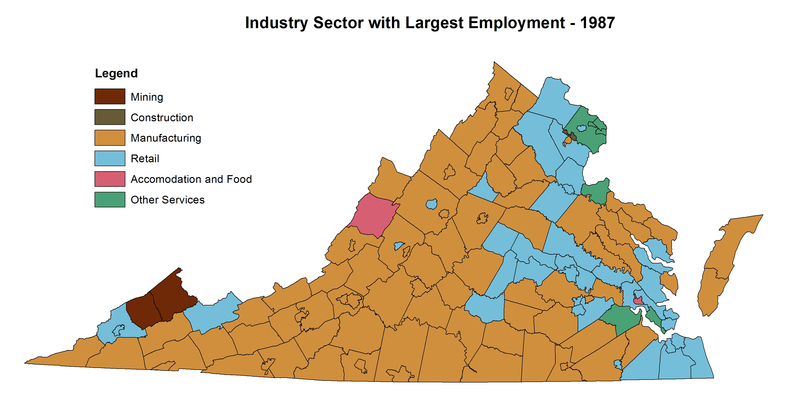 Retail trade has led in Virginia since 1996, even as the rest of the states have been taken over by healthcare. This map tells us a lot about the US at a high level, but doesn’t tell us much about what’s going on in different parts of Virginia. So I decided to try to reproduce this map series at the county level, using the census’ County Business Patterns data. This turned out to be harder than it originally seemed, since data has to be converted between the old SIC (Standard Industry Classification) scheme to the NAICS (North American Industry Classification System) and then a lot of suppressed data has to be estimated. Certain industries are excluded, including self-employed individuals, which shortchanges agriculture. But I think I came up with reasonably accurate results regardless. For more information on what falls under each of these categories, see the census’ webpage here. There is also a difference between employment data and occupation data from the American Community Survey, which could give us a slightly different picture. 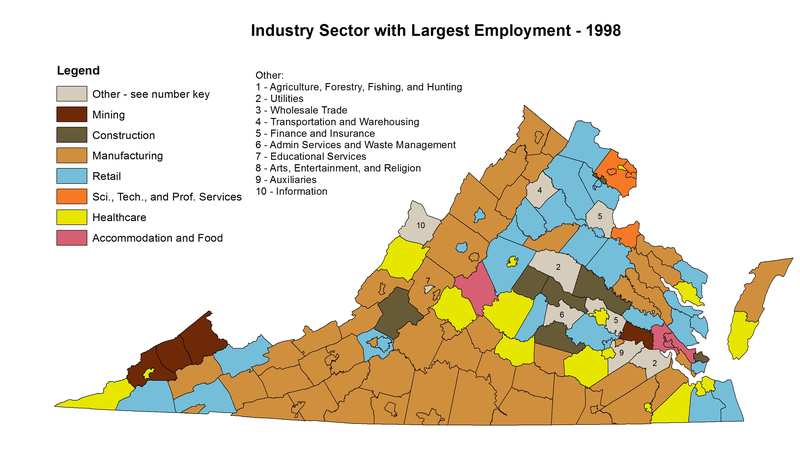 Interestingly, Virginia’s counties appear to be getting more specialized, with a much larger variety of industries dominating counties than did 25 or even 15 years ago. Manufacturing is still the dominant employer in a wide swathe of counties, but healthcare and scientific, technical, and professional services are clearly ascendant. It’s important to note that many of the places where healthcare, retail, or professional services are dominant are also the localities with the highest populations.